For 4 minutes and 45 seconds, I floated in a bubble of pure loving bliss. And even though there were one hundred and fifty pairs of eyes watching me float, for me, they simply did not exist. There was only room for two people inside my bubble: me and my son Seth. This past Saturday, my baby, my firstborn child, got married. And so there we were, having the traditional Mother-Son dance. I chose the song A Thousand Years by Christina Perry because I have loved my son for a thousand years, and I will love him for a thousand more. We both knew how special this moment was. And so, for 4 minutes and 45 seconds, we danced, we laughed, we cried and we whispered words of love and joy to each other. I will treasure those sacred 4 minutes and 45 seconds for the rest of my life. 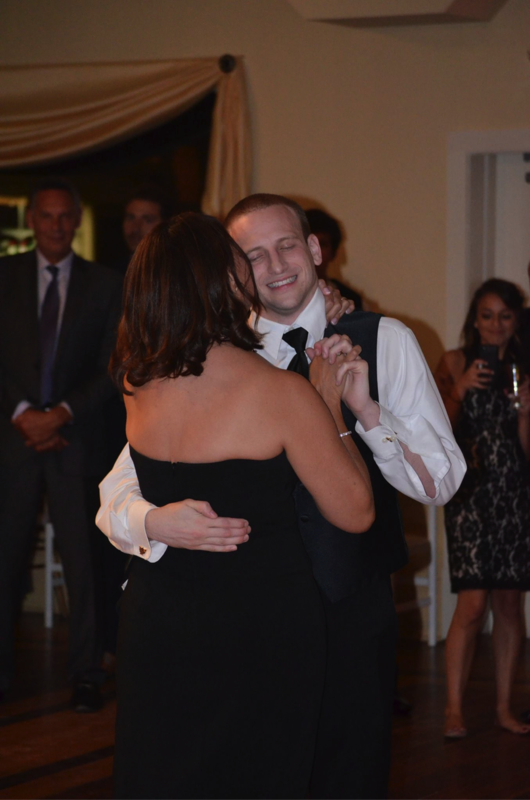 How can I describe what it felt like to watch my son marry the woman of his dreams? I have the same exact wish that every single mother has when it comes to who their child will marry. We hope and pray that our children will choose someone who loves, appreciates, respects and adores them for exactly who they are. And that is exactly who Seth chose. Rachel is brilliant (she has a Masters degree from Harvard), incredibly thoughtful, unbelievably kind, gentle and caring. She is amazing! I realize I am boasting. I can’t help it. She is that great! From the moment when Seth and Rachel locked eyes as she walked down the aisle, their mutual love and adoration for each other was palpable. They simply could not stop beaming. I mean come on, just look at this beautiful bride! I know that life gives us many Ups and Downs, but this particular Up was absolute perfection. This particular Up completely flooded me with a feeling of euphoria. It was the kind of Up that made me weep with joy, made me dance all night long, and made me stop to soak in every single second. This Up was THE very best Up that life has to offer! And so now, as I sit here sipping my coffee on Monday morning, the day after one of the most glorious weekends of my life, I am still basking in the glow of it all, still feeling so grateful for this exquisite time in my life. I urge you to make sure that you take in all the Ups life grants you. Drink in every single millisecond of them. PS I want to share one more thing with you. Check out this precious gift Seth and Rachel gave my husband and me at the rehearsal dinner. How sweet is that!